ice-cream for breakfast, or what would you do for a photo? I sometimes wonder when I’m trawling through Instagram or looking at other places (mainly Pinterest, let’s be honest but then occasionally Facebook) what do other people do for photos? Sometimes I ask people, because if I don’t ask I don’t know right? In fact that could be my motto because I ask a lot of questions, and I mean A LOT, but sometimes I like to just be in awe and experience the amazement without knowing, until I want to do something similar. Or can’t do something along the same theme. Like today, with ice-cream. 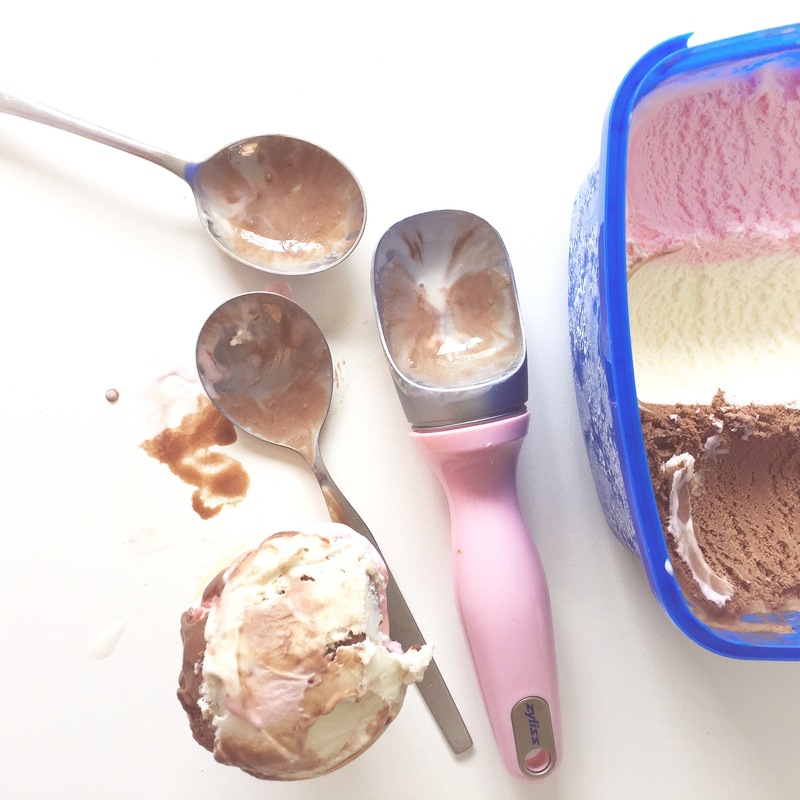 Because who knew working with ice-cream would be so darn difficult?!? Okay, it just me that was clueless? In this months alphabet series over at #FMSphotoaday I’ve been trying hard to get some photos I could use in a poster for E’s room, or for a booklet for her. I know there are awesomely creative geniuses who have already done this and you can buy them! (@thebeecreative for example) but I wanted to make this one a bit personal, it has some of E’s things in it and we talk about the letters each day. I like to think of it as learning throughout doing our everyday. Anyway, one of the things that popped into my mind today was ice-cream because it has to be easier than an igloo right? 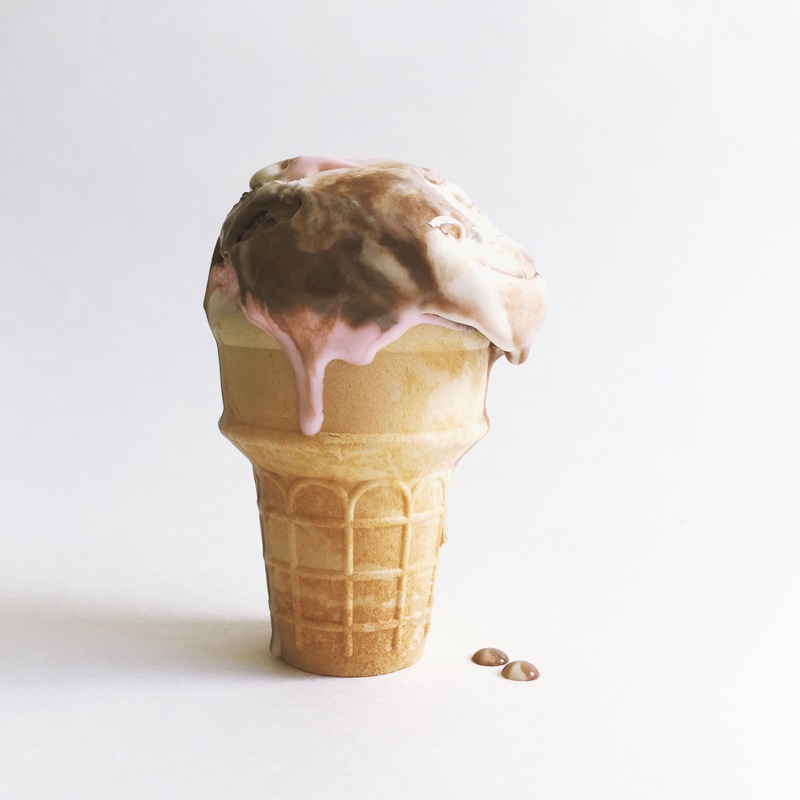 Creating an ice-cream photo isn’t dangerous or life threatening, but let’s just say I had ice-cream for breakfast today. Not really something that I’m enjoying right now. After the fact. Those all kinds of wrong feels you get, you know? Anyway, I have it and I won’t be doing it again in a hurry. Though I did do the photo again, this afternoon. This time though Miss E got herself and ice-cream and was super excited to get amongst some Neapolitan, let’s face it, who isn’t? Though strawberry? vanilla? Not so much. Oh who am I kidding? Just give me a big old tub of chocolate. And look, while you’re there, pop some choc chips in it or some fudge or caramel. Or I’ll be happy with some vanilla, sea salt, caramel or macadamia, all in one tub of course. Anyway, the photo and our return journey to ice-cream today. Take two….saw me making Miss E an ice-cream, as mentioned. She then proceeded to go outside, probably so she wouldn’t be wrangled into being in a photo. Smart girl. I took everything into the bathroom, the best light in the house and unless its lunch time it’s not too directional, i.e. not too many shadows most days. It’s about 22 here today, and warmer in the bathroom. The ice-cream started to melt fairly quickly. I couldn’t work fast enough, nor could I find anything to tell me how to do this properly. Basically, twice today I made the worst ice-cream cones I’d ever made. And quite frankly, I’ve had enough now. 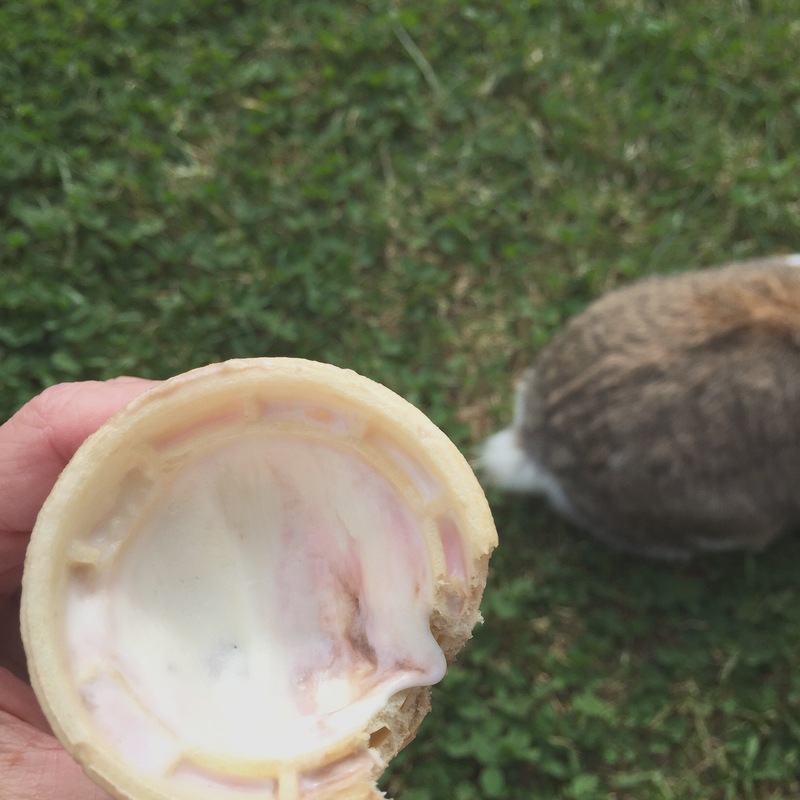 But I did spend time outside with E and Fudge (our rabbit) while I ate mine and she ate her dripping remainder. And I left the mess inside, hoping someone would clean it while I was away. No one did. The result of all this? 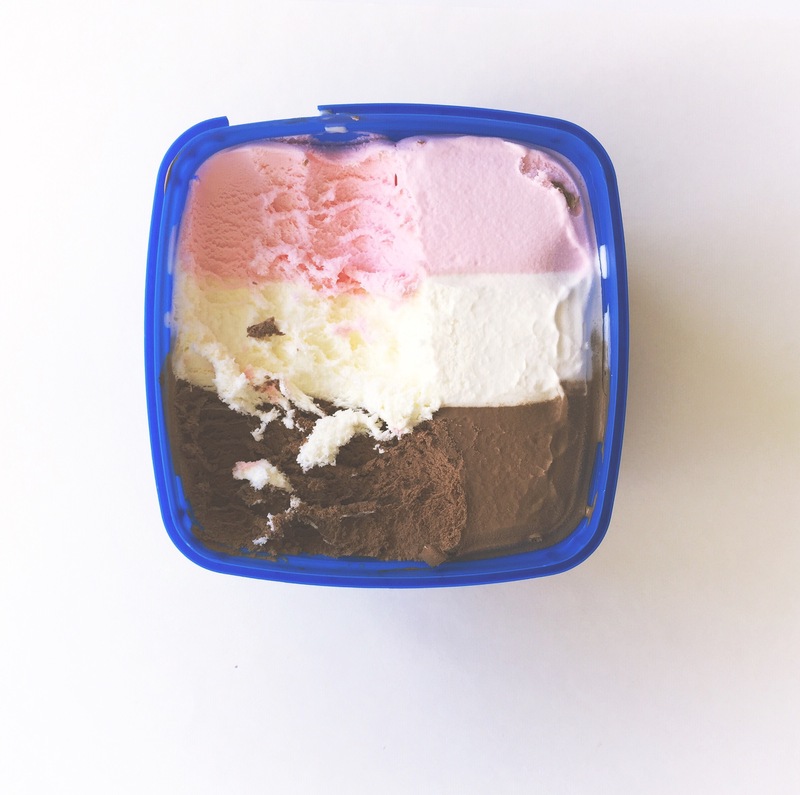 Last night saw the chap (the patient, other half of me) going out to the shops for ice-cream so I’d have a tub of Neapolitan to use today. How awesome is he? And I ate two ice-creams. In one day. One for breakfast. I took a stack of photos. None of which will probably be used. Oh, except here. For you. I’m now over ice-cream photos. So I moved on to ice. Feel free to slap your hands over your face and exclaim ‘oh no’. Yep. Lets just say I’ll have another go at ‘i’ tomorrow. Maybe. And look, I’ve done lots of things to take photos over the years, some eye-rolling and eye twitching like this. Some maybe verging on the dangerous. Well, kind of, just dangerous, but I don’t tend to do those as much now I have E. And it got me thinking again, wow, the things we do for a photo. Are others as clumsy and dangerous as myself (again not the ice-cream being all dangerous)? What do you do for your photos (I know there are cool things out there like using frozen foods or travelling 100’s of kms with a bunch of balloons….this last one was sayhellojo, an awesome chum, do yourself a massive favour and check her out)? Fail or otherwise? How far do you go? The snorty laughter type stuff, the eye rolling and the dangerous? Feel free to leave a comment and let us all know. I bet we ALL do some intriguing things. I can tell you right now this is just one of mine. And I can tell you that like this, they’re the dizzy limits! Some not on the most dizzying scale, but quite a few are.